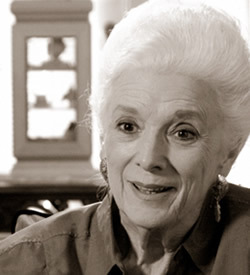 With her long white hair, perfectly manicured nails, and soft southern accent she is the epitome of a southern belle. One can almost picture her sitting in the shade outside her gracious South Texas Victorian home, waving a fan and sipping a mint julep. Most people call her Dr. Joyce. At the age of six Dr. Joyce was brought back from the brink of death by a caring chiropractor, and she decided then and there that she would learn and practice this healing art. She endured a difficult childhood while living in a Texas Oil Camp, an abusive relationship that ended in a painful divorce, and the death of her first child. Despite all of these hardships, she still managed to finish college as a single mother and confidently entered the male dominated field of chiropractic medicine at a time when the profession itself was considered so controversial that chiropractors were regularly jailed for practicing in Texas. This was due in part to the new accreditation standards the AMA was forcing chiropractors to adopt. Dr. Joyce would not be deterred. She remarried and with her husband and children built a successful practice and went on to become a worldwide lecturer for one of the nation's leading chiropractic seminars. And did we mention that she raises championship longhorn cattle? Watch her saunter up to Wow, her Grand Champion Trophy Steer, a beast of Pleistocene proportions, as he swings around his 9-foot wide horns to listen to her sweet talk him across a barbwire fence. Joyce Kimble is a force to be reckoned with.